Open your Registration Confirmation email. 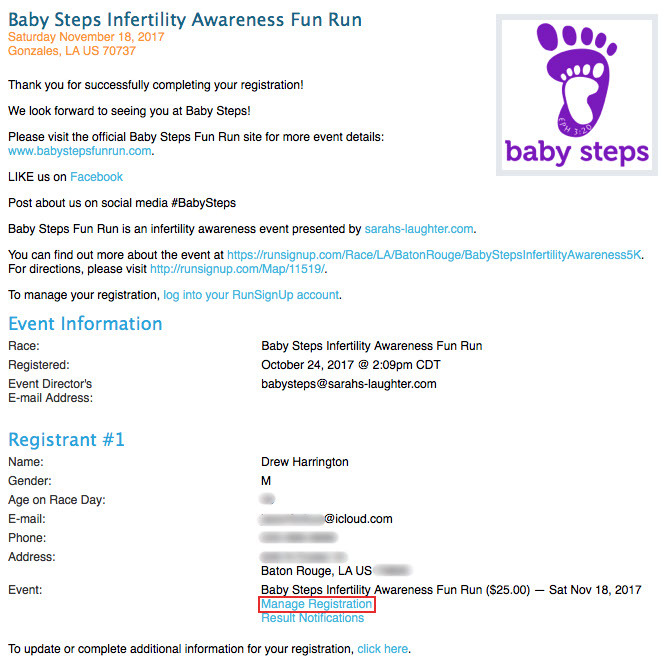 When the runsignup.com page opens, click on "Fundraiser" on the left under the Baby Steps logo. Here's where it can get confusing. To ensure that you get credit for every donation—and every ticket you deserve—we only do TEAM fundraisers for Baby Steps. However, runsignup.com now forces you to create an Individual fundraiser. So, go ahead and create the individual fundraiser; we'll delete it later. The important part here is to scroll down to "Create or Join a Team Fundraiser (Optional)" and check the box "New Team Fundraiser." Here's where you give your team fundraiser a name. Here is the formula: "Team name - Your Name." Select your New Team Fundraiser Name & copy it (⌘-C on Mac, control-C on PC). Click (or tap) "SET UP FUNDRAISER" to finish.